House price growth in London has slowed to a nine-year low, while prices in Edinburgh and Manchester are rising faster than in any other major UK city, according to a survey. The latest UK Cities House Price Index, from the property research firm Hometrack, shows that Aberdeen and Cambridge were the only two out of 20 major cities where house prices were falling over the past 12 months, by 5.7% and 0.9% respectively. In Aberdeen, the fall in crude oil prices has affected housing demand and property prices, while Cambridge has had a similar pattern of growth as London since 2009. The price-to-earnings ratio is in double digits and tax changes have put off investors. In other areas of the country, prices are still growing strongly, by 7.1% in Edinburgh and 7% in Manchester, year on year. 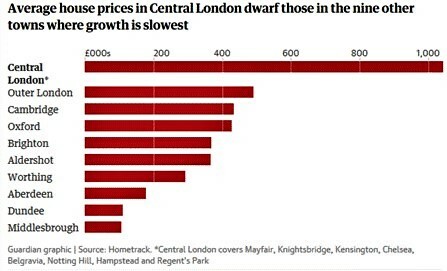 In London, prices are falling in more than 40% of the capital’s boroughs, dragging down the annual rate of growth to 0.4%. In central London, prices are down 4% year on year. The report chimes with other recent surveys, which have shown prices dropping across much of London. Homes in the capital have become unaffordable for many people after years of surging prices, while wage growth remains meagre and lenders apply tougher mortgage criteria. 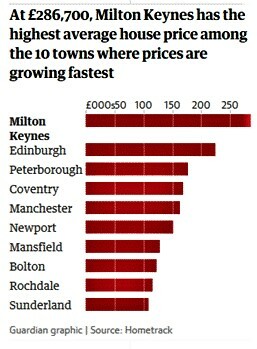 According to Hometrack, London is one of five cities – along with Cambridge, Oxford, Belfast and Aberdeen – in the 20 included in its survey where house prices are falling in real terms (adjusted for inflation) because the annual growth rates are below the rate of consumer price inflation of 2.4%. 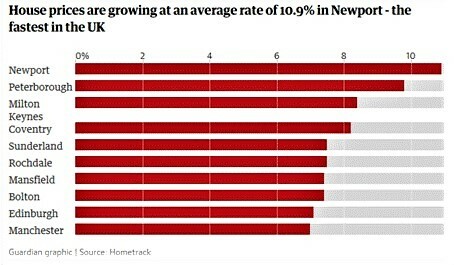 The average home in London is worth £491,200, still far higher than the average cost of a house in most other UK cities, but the gap is starting to narrow. A typical home in the capital is four times more expensive than in Liverpool (£118,800); three times pricier than in Manchester (£163,300) and more than twice as expensive as in Edinburgh (£225,300). 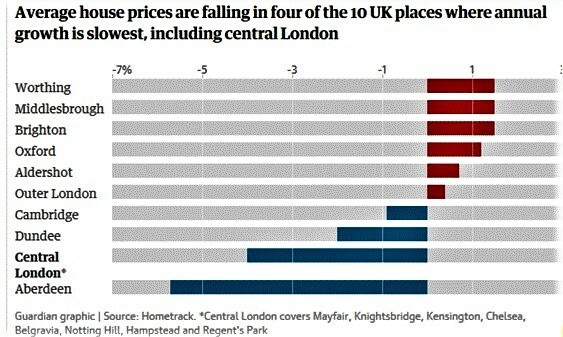 Hometrack expects the gap in prices between London and other UK cities to close further over the next two years, following a similar to pattern to 2002-2005 when London house price growth was relatively weak compared with the rest of the country after a period of surging prices from 1996 to 2000.